Every pursuit has its own "jargon," verbal shortcuts that let practitioners talk to each other more efficiently. Here are some terms used in bonsai in the USA, that may be new to those who are not acquainted with bonsai or just getting started in the art. This glossary will be expanded if and as necessary. If you'd like to see a particular term included, shoot me an email at treebeard20@gmail.com. Akadama, akadama: A clay product from Japan; its particular mix of minerals makes it highly beneficial to bonsai when used in the potting mix. Different grades of hardness. Creation styling: Common term for a tree's first major styling, when the line and basic form are set, and major branches arranged. Can be thought of as the dividing line between "raw material" and "bonsai-in-training." Growing container/box/pot: A temporary container intended to promote rapid growth of a prebonsai or a tree in training, usually by offering the roots plenty of room. Half-hardy: A plant that needs an annual cold dormancy for its long-term health, but cannot survive typical winter temperatures outdoors, in a given location. Hardy: A plant that needs an annual cold dormancy for long term health, and can survive typical winter temperatures outdoors, in a given location. Protection from wind and hungry critters is still usually a good idea. Kanuma: A clay product from Japan, used as a potting medium or ingredient in a mix. Reported to be be very beneficial to acid-loving plants. Mame: Japanese; a size designation. 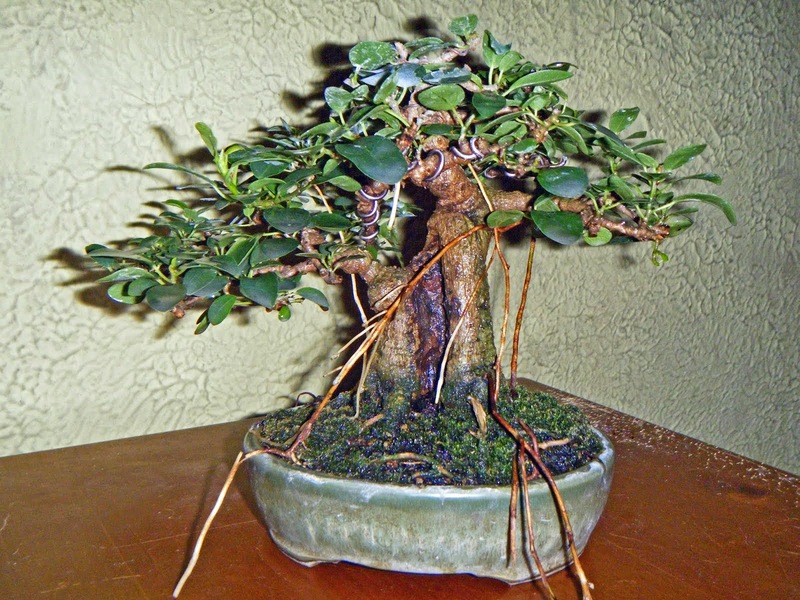 Mame bonsai are between 3 and 6 inches high from the soil line (7 to 15 cm.) The term has been widely borrowed into Western languages. Pumice: A volcanic rock sometimes used in potting mixes. Highly porous because of the "frothiness" of the particular lava from which it forms, thus good for both water retention and aeration. Floats on water. Scoria: A volcanic rock sometimes used in potting mixes. Like pumice, it forms from a "frothy" lava, but is denser, with not quite as many pores. Doesn't float on water. Commonly sold as "lava" in the USA. Shohin: Japanese; a size designation. Shohin bonsai are between 6 and 12 inches high from the soil (15 to 30 cm.) The term has been widely borrowed in the west, and is sometimes used as a general term for bonsai under 18 inches tall (45 cm). Soil: Commonly used for any potting mix. The thing to remember is that garden soil, plain old "dirt," is almost never included, since it won't drain well enough in a container. Substrate: Another term for a potting mix. Avoids the question of whether garden soil is included. Tachiagari: Japanese; a tree's lower trunk, immediately above the nebari. Another significant part of a bonsai's image. Tender: Refers to cold resistance; a tender tree cannot survive freezing for more than a very brief period, if that much. Often used interchangeably with "tropical." Training container/box/pot: A temporary container that offers the roots about as much room as they will have once the tree is in a permanent pot. Used after a tree has reached an acceptable girth and height, but still needs refinement. Using one gives the artist time to choose a good permanent pot without rushing. Turface ®: A fired-clay product widely used in potting mixes in the USA. Holds some water while allowing good aeration. Doesn't break down for years. Yamadori: Japanese, literally "mountain tree;" a tree collected from the wild at styling size. Trees and shrubs collected in urban settings, at styling size, are sometimes called "urban yamadori." The word is both singular and plural.